Movie Beards: Blind Panhandler: "M"
Director Fritz Lang's first talkie, M, also so happens to be the first serial killer movie of the post-silent era; Hitchcock's silent-era The Lodger (1927) is considered to be the very first. Lang's picture focuses on child-killer Hans Beckert and the investigations leading to his eventual capture. With the entire town looking for a haunting child-killer, nobody would expect that the person to crack the case would be a blind man. 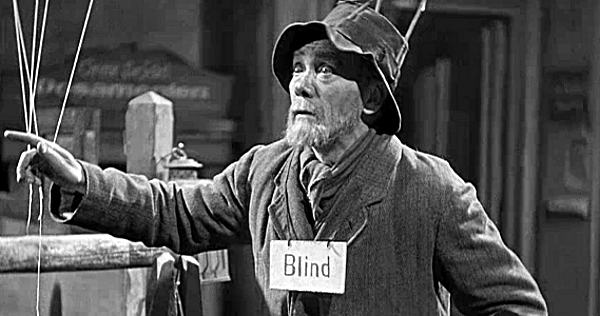 But this is no ordinary blind man. This blind man has a beard. That's right. The first serial killer in post-silent era film was caught by a man with a beard. Near the beginning of the film, the audience is introduced to Hans Beckert as he initiates his abduction of young Elsie Beckmann. Along the way, Beckert purchases a balloon for Elsie from a blind panhandler while whistling "In the Hall of the Mountain King." Later, Elsie is declared missing, and Beckert sends a letter to the press expressing his intent to kill again. The Berlin police force and even the underground syndicate of petty criminals exhaust their resources to find Beckert, but no one can find a reliable lead. An unlikely hero in the form of a bearded, blind balloon salesman later recognizes Beckert's characteristic whistling of "In the Hall of the Mountain King" and puts two and two together (for you pun-lovers, he puts tune and tune together). This discovery allowed one of the town beggars to find Beckert and slap a chalked "M" (for Mörder) on the back of his coat so that he could be spotted in public. People will tell you that when you go blind, you experience an increased ability in your other senses. Those people are wrong. Only those who grow a beard in the absence of sight may gain such power. Had the blind panhandler dropped two bits on a shave and a haircut that morning, he would not have retained his fine-tuned recognition of Beckert's characteristic whistling. Moral of the story: Never trust eyewitness testimony. Trust in the beard.